The term ‘digital native’ is often used to refer to someone who has grown up with digital technology and can use it easily and intuitively. The term ‘digital immigrant’ is used to refer to someone who hasn’t grown up with digital technology but has learnt, or is learning, to use it as an adult. I’ve always felt slightly uncomfortable with both these terms on the grounds that it seems unnecessary to import these labels, and the potential underlying note of prejudice which accompany them, into the digital world. However, at the same time, I recognise that the term ‘digital immigrant’ aptly describes my situation. Along with thousands of other primary language teachers, I am constantly learning to adapt my skills in order to use new, rapidly-changing digital tools for teaching children, and to make the most of technological resources in my professional life, both in and out of the classroom. Technology in education has come in waves over the years and often mistakenly been seen as a panacea for teaching. I’d like to share three personal landmark examples which illustrate changes in educational technology and show how other ingredients are also essential in creating rich and rewarding learning experiences for children. As a child, I learnt German in a language laboratory that was my school’s prized new acquisition. Seated in individual booths with cumbersome headphones, we parroted dialogues and drills into a microphone, and could re-record our attempts to imitate the perfectly articulated, adult German voices as many times as we liked. Every so often there was a rushing noise that alerted you to the teacher listening in, ‘big brother’ style, to how you were doing. To this day, I have accurate recall of many of the ‘chunks’ and dialogues I learnt. But, with hindsight, I suspect that this was mainly due to the affection, patience and humour shown by our teacher during these strangely alienating ‘lang lab’ sessions. It was also due to the way she enriched our learning experience by, for example, organising German ‘tea parties’, with goodies such as home-made ‘Apfelstrudel’, to get us to practise and transfer our parroting skills to ‘real life’. Years later, at a school where I worked after becoming a teacher, we could sign up on a weekly basis to take our classes to the computer room – the days of Computer Assisted Language Learning (CALL). A mixture of chaos and joy usually ensued as the children, seated two to a computer, played simple vocabulary matching games or did gap-filling tasks, at different levels of difficulty, based on previous work that had been done in class. At the time – pre-internet and before most people had computers at home – the weekly sessions in the computer room were a novelty and welcome break from the classroom. 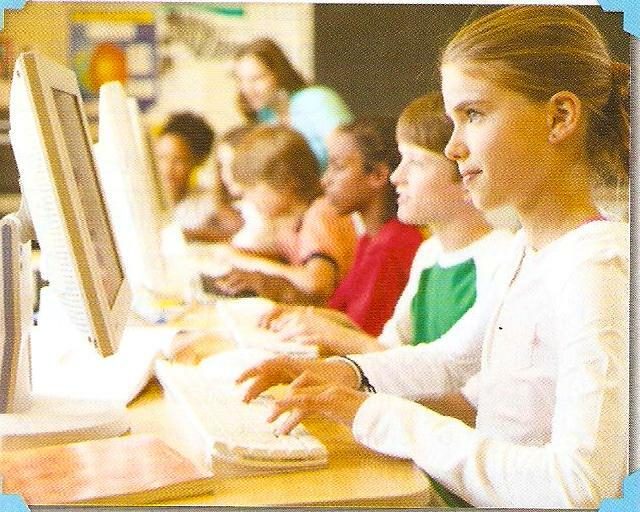 The children who were most savvy at using the computers quickly learnt to perform successfully in all the tasks at the highest levels of difficulty. But how much language learning took place? Well, I’m not sure, and it would be interesting to ask those children what they remember now as adults. As with the language laboratory, however, I would hazard a guess that the overall extent and quality of learning also depended on the way the experience of using the computers was integrated and balanced with other aspects of learning face to face. Much more recently, last week in fact, I spent time with a class of 11-12 year olds in a Spanish state primary school in which all the children have individual laptops with internet connection in their classroom. The children were using their laptops to work on a biology project on nutrition in their first language. This had involved the teacher giving input in the form of a text projected on the interactive whiteboard (IWB) which the children had copied on to their laptops and then discussed. As follow-up, the children had written personal opinions in response to the text on their laptops. They had then embarked on researching different diseases caused by nutritional deficiencies in groups, using prescribed websites. The children seemed highly motivated and self-driven by the project, which would later lead to a final outcome of giving presentations on their findings to the rest of the class. Their motivation was undoubtedly partly due to pleasure and enjoyment in using their laptops, but not exclusively so, as the children have had the laptops and an IWB in their classroom for almost a year and so the novelty has largely worn off. The main overarching factor seemed to be the enthusiastic and magnetic presence of their teacher, who succeeded in communicating his interest in the subject infectiously, and gave the children constant encouragement and support to help them find their feet in working in an independent and responsible way. So, what reflections about technology arise from these three examples? We need to embrace technology (if we are lucky enough to have it available). Unlike the language laboratory which was an isolated educational innovation in its day, technology now infuses all aspects of our daily lives, and language teaching at primary level is no exception. Technology still needs a teacher. When working with children, technology still needs the face to face presence, encouragement and planned support of a teacher, or more competent other person. Affective relationships between teacher and children are as important as ever, if not more so, given the potential isolation that technology also brings. Technology is a powerful tool to enhance learning but it isn’t a panacea. Change is relentless but needn’t induce anxiety. The laptops of the children I met last week will be as out of date to them, when they’re adults, as the language laboratory is to me now. How will their children be learning? Technological change is happening at an unprecedented speed – that is a cliché. At the same time, we should not be made to feel anxious or guilty if we are not always fully up-to-date on the latest trends and terminology, as long as we’re willing to keep on learning and experimenting, and don’t adopt self-perpetuating attitudes of ‘learnt helplessness’ (I can’t use it, so I won’t use it). The methodology we use needs to adapt with the times. If we are to use technology successfully, our methodology needs to adapt and change as new technologies develop and we introduce them into our teaching. For example, as technology provides increasing opportunities for individualised, self-regulated learning (as suggested in the biology example above), it would be counter-productive to continue to teach in a whole class, lockstep way. Strictly ensure that rigorous school internet security procedures are in place. If children are going online, check out and pre-select websites they can use. Prepare and practise as many times as you need to before going into class. Only use tools you feel reasonably comfortable with but remember that ‘learning by doing’ is important as well. Don’t feel pressurised into using technology for its own sake. Don’t worry if things go wrong – it happens, and you can probably learn from it and improve as a result (and the children will love to help out). Have clear learning goals and planned outcomes as for any lesson. Structure lessons to integrate technology with language development and other aims e.g. conceptual, cognitive, socio-cultural. Explain to children about copyright and plagiarism (in their own language). Use strategies to ensure that children don’t copy and paste text directly from websites and claim it as their own work. Encourage children to be creative and take pride in their work but be wary of letting them spend a lot of class time, e.g. preparing beautiful powerpoint slides, which may be hard to justify in terms of their language development. Any thoughts or comments? It’d be great to hear your views. Note: I’m very aware that this post only applies to educational contexts where technology is easily available and electricity cuts are rare. It’s also likely to be more relevant to teaching upper primary rather than very young children. The terms ‘digital native’ and ‘digital immigrant’ were originally coined by Marc Prensky. The photo is from Footprints 3, Macmillan Education. For preparation and practice, I’d also recommend checking how your material looks in class before using it, especially if you are using a projection screen or IWB. Sometimes colour clashes, difficult to read text etc may not be obvious ona regular screen. I also have an issue in my school with bright sunshine sometimes making the screen difficult to see – some classrooms are best used in the morning, others in the afternoon! Regarding clear learning goals, I strongly believe it’s always important to have a specific use in mind for whatever technology your using. Is it really educational or just superficial fun? (Superficial fun is good on ocassion though!) Also, is using this technology really worth it? Many times I’ve seen teachers pour hours into a Powerpoint or video clip, getting it just right, only to find it takes 2 minutes of class time or causes more problems for students than just using the whiteboard! Great to see you here again! Thanks so much also for this practical down-to-earth advice. That’s a really important point you mention about checking how your materials look in class before you use them – it can be really disappointing if, after all the preparation, what looked so wonderful on a regular screen is difficult to see because of the light, screen resolution, duller colours or whatever. Should definitely be included as another top tip! I completely agree with you about having a ‘specific use’ in mind for whatever technology you’re using. Thanks also for expanding the point about not feeling pressurised into using technology for its own sake – as you suggest, there are often plenty of other ways to achieve your goals that are quicker and easier to prepare. I like your point about ‘superficial fun’ too – definitely an important ingredient in learning and ‘good on occasion’ as you so rightly say although can’t override educational goals so guess it’s always a question of getting the (at times quite tricky) balance right. To what you and Dave have said I’d just like to add that “technology” can still be of help to teachers who are not lucky enough to have an IWB and pupils with a laptop apiece. “Technology” i.e. internet access, Skype, Slideshare, Yahhoogroups e-lists, Twitter, Facebook if you enjoy it, a bewidldering choice of Web 2.0 tools even Second Life can provide the individual teachers with a colossal amount of help in preparing lessons and, even more importantly, access through online communities with other teachers who can offer support, make suggestions, answer questions and mitigate the feeling of isolation that many teachers feel teaching quite on their own. Thanks very much for dropping by – and yes, I’ve been meaning to use the YLT NIng much more – sorry I haven’t, there just never seem to be enough hours in a day! Thanks so much for making the point about how we can make use of technology ourselves (if we live in a context where it’s easily available) even if we don’t have IWBs and laptops in our classrooms. In fact, I think that’s often one of the most important uses of technology for us as teachers these days – how we get to hear about new tools, share resources, exchange ideas and generally support each other and not feel quite so isolated, as you say, in the ever ongoing and upward learning curve. ‘Bewildering’ is often the word though when we realize how much there is out there to discover and that’s where having a community like the YLT group to share things with can be so wonderful. It’s also where things like using Twitter and building up your own PLN can open your eyes to new things and be really helpful and supportive too. Thanks again for this great contribution which should also be included high on the list of top tips! thanks for this. I have been working with technology for many years now and your post really does summarise the most important lessons to be learned / born in mind … and not just for younger learners. Great to see you here – many thanks for dropping by! It’s reassuring to have endorsement from someone like yourself who’s so experienced in working with technology about lessons to be learnt and very interesting that you feel these apply to older learners too. Very comprehensive guide. Using technology can be such a minefield in the classroom. I’ve often had negative experiences with students using websites to “translate” whole passages into English. However it’s true that with a structured plan allowing young learners to use their computers in class can spark some enthusiasm. In particular, students good with technology who don’t normally participate in English tend to brighten up in class. That’s what I’ve found anyway. Hi Jon, Many thanks for writing. It’s good to hear that the post resonated with you. I agree that a ‘structured plan’ can produce enthusiasm and also provide a framework for worthwhile work. The issue is often to strike a balance between children working independently and productively and not wasting time. It’s my experience too that the ones who are good with technology but not necessarily good at English seem to ‘brighten up’ and feel challenged when technology is part of the pedagogical mix, which makes it all the more worthwhile to try and achieve successfully.